It actually looks quite confortable and even if the top part isn't removable, it looks like there's enough room to glide in a warm blanket in there with you as well. Assuming it keeps up the temperature of the specs; there prices aren't all that bad either for the size. Yeah, I am actually really excited bout this. The more I think about it the more I like it. As a paddler the down makes me hesitant. But I might do it anyway. Interesting for sure. 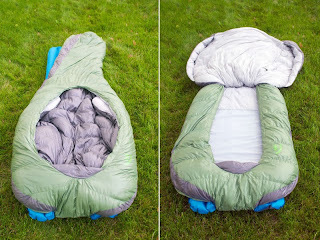 A new sleeping bag is next on my list for 2014. I don't know if it is next on my list, but it is on the list. Have you seen the Werner Ovation? It will be on the PO Christmas List post. Stay tuned.